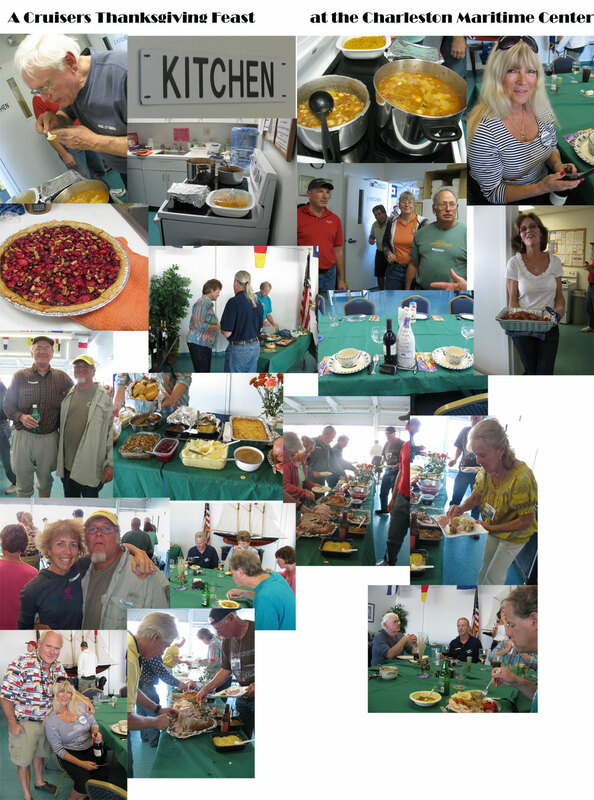 As cruisers arrived at the Charleston Maritime Center – Dockmaster Bob generously volunteered to OPEN the KITCHEN doors and the adjacent conference room to cruisers for a Thanksgiving feast. Living on a boat, I have learned to cook with a single propane cooktop burner – which basically means I skip the cooking notion altogether and just make salads. Now, a REAL kitchen means microwave open, a real oven that you can fit more than a fistful of food, larger than human sized refridgeration and a sink with running hot water. Thanksgiving can’t come soon enough! What began as a carefully choreographed meal plan for 8 – quickly morphed into a free-for-all mealplan to feed 28. Nobody knew what food choices were being selected for the pot-luck dinner – but with a full sized kitchen, and a bunch of hungry cruisers, it was destined to be a feast. The traditional turkey and ham, was supplimented by even more turkey…a pork tenderloin…Bob’s special Fish Stew – and an assortment of side dishes with enough food to feed a crew of 50! There were no shortages of dessert – from apple pie, cherry pie, pecan pie, chocolate cake, cranberry pie and key lime pie to name a few. Bellies were full, waistlines expanding and the atmosphere was filled with delightful chatter, talk of next port destinations and of course, boat repairs! Thanksgiving in Charleston – cruiser style! Previous PostA tour of Charleston…Next PostThere is a HUGE freighter directly in front of me!! !